GreatSchools recently participated in and won 2nd place at HackEd, an inspiring 1-day education “hackathon” sponsored by the Bill & Melinda Gates Foundation at Facebook’s headquarters in Menlo Park, CA. College Summit and King Center Charter School co-sponsored the event. The goal of the hackathon was to encourage developers, education experts, and nonprofits to prototype Facebook apps that help low-income and first-generation students get into and graduate from college. HackEd was also the official kickoff for the College Knowledge Challenge, a broader challenge issued by the Gates Foundation with 30 more prizes totaling $2.5M. More than 150 people attended HackEd, including representatives from organizations such as iMentor, 4.0 Schools, EverFi, Mytonomy, Unigo, and more. Reaching nearly half of all American K-12 households, GreatSchools is the leading source of information about schools for parents nationally. For more than a decade, we’ve published data to help families understand how schools are performing academically and we’ve coupled that with an unparalleled collection of community ratings and reviews – more than one million at last count. 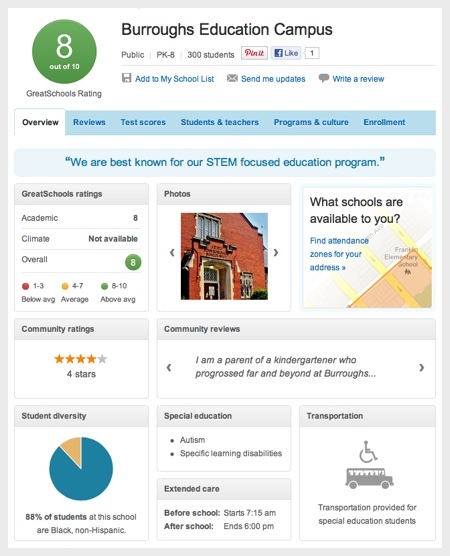 While our ratings and reviews are one of the best ways to learn about a school, we know that parents must also look beyond the numbers in order to fairly assess whether a particular school will be a good fit for their child and family. They need reliable information about a school’s programs, culture, and unique features – information that is hard to come by at scale.